Light is one of a photographer's most important considerations. In fact, any photograph captures the effect of light on objects, whether taken in natural light or the warm glow of incandescent light. A photographer who understands how the eye and lens perceive the color spectrum can make full use of light in photography. Both the natural light of the sun and artificial incandescent light appear white to the naked eye. However, if you shine light through a prism, it splits into a rainbow of colors. This effect shows how the “color” white contains every shade in the color spectrum. When light hits an object, the object absorbs some of the color spectrum and reflects back the rest of the colors. The portion of the color that is not absorbed by the object but reflected back to eye is the color that the object appears to the human eye.For instance, a white wall reflects most of the color spectrum black. So our eyes (and the camera lens) see white. While a red rose reflects the red portion of the color spectrum and absorbs the rest, a black object absorbs the entire color spectrum. Natural light in photography is not as consistent as you may think. At different times of the day, different shades of the color spectrum dominate natural light. For instance, at midday, the blue portion of the color spectrum is dominant, producing a "cool" light. Color photography taken at midday produces the clearest, sharpest pictures in bright light. In contrast, natural light at sunrise and sunset emphasizes the red portion of the color spectrum.Known as warm light in photography, sunrise and sunset light produces warmer pictures with a softer contrast. 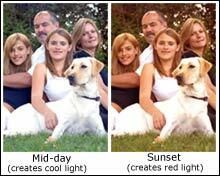 When photographers use artificial light in photography, the effect of the lighting depends on the type of bulb used. The warm dispersed glow of incandescent light produces an effect that is dramatically different from that produced by the sharp, narrow, focused beam of a street light. Photographs taken with incandescent light often have a yellow tinge. A photographer can combat this tint in two ways. One method is to use a blue filter to offset the excessive yellowing. If you're using a film camera instead of a digital one, you can use tungsten film that is designed for professional studio lights. Although it wasn’t intentionally designed with incandescent light in mind, tungsten film reduces the yellow tones so often found in indoor color photography. Florescent lights produce a diffuse light that often translates into greenish tinges in color photography. Using a fluorescent or daytime filter helps remove this unappealing color. Street lamps, like florescent lights, may cause a greenish tint in the resulting pictures. However, a photographer can use this effect to his advantage: in the darkness, this greenish quality can produce mysterious or ghostly effects. The direction of light in photography is important: different angles of light produce different shadows, changing the appearance of your subject. Light in photography may be diffuse or direct. Direct light, such as light from the noon sun, hits the subject from one direction. If you're looking for high contrast between light and shadows, direct light is a good choice. On the other hand, diffuse light hits the subject from several directions. Florescent lighting is one example of diffuse light in photography. The loss of contrast that diffuse light produces mutes colors and softens the image. manual: when you want to manage the lighting of each shot. This requires that the photographer aim the camera at white paper to change the lighting settings manually. Color Photography or Black and White? While lighting is important for color photography, it is even more important for black and white or sepia photography. While this fact seems counterintuitive, the lack of color means that the key feature of black and white photography is the contrast between light and shadow. The basic rules of light in photography apply to black and white photos just as they do to color photography. For example, direct light creates a higher contrast than diffuse light. Because the contrast between light and shadow is much more obvious in black and white than in color photography, the photographer should opt for direct light when composing the shot.